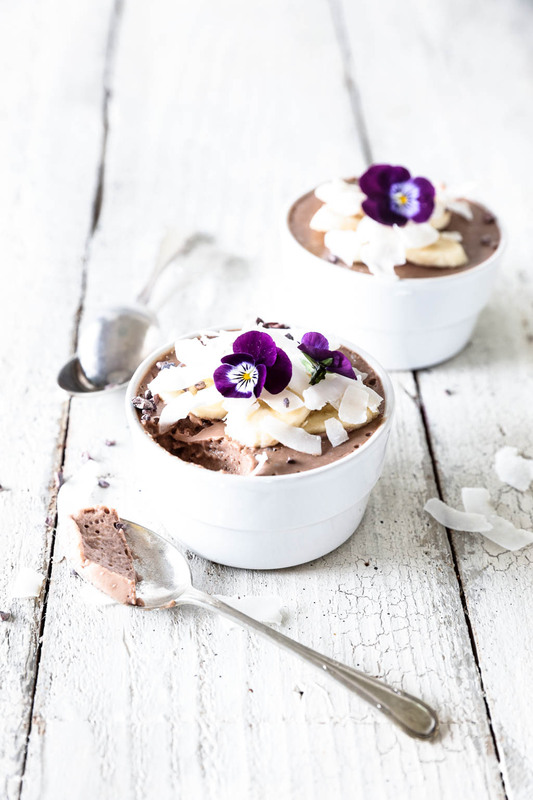 I had the idea for a banana based chocolate mousse in my head for ages, so when I came across Little Island’s new coconut milks it seemed like the perfect excuse! After playing around with a few combinations I eventually ended up with two banana chocolate mousse recipes using both types of coconut milk: original and chocolate. The first recipe uses the chocolate coconut milk and is super simple with just three ingredients. All you need to do is place all the ingredients into a high speed blender, blend on high, pour into serving bowls and pop into the fridge to chill and firm up! The second mousse recipe has a few more ingredients and uses the original drinking coconut milk. It’s just as easy to make, simply place all the ingredients into a blender, blend until smooth then pour in melted coconut oil while the motor is running. The catch is both these recipes need to be made in a high speed blender as the blender whips the air into the ingredients to create the light airy mousse texture. While the mousses have a very similar airy texture, they do differ slightly in flavour. 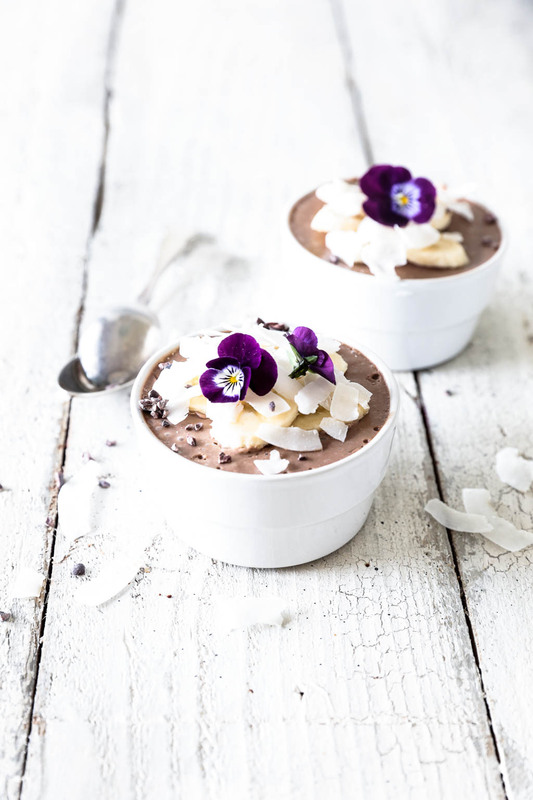 The super easy three ingredient mousse has a stronger banana flavour while the second recipe has a richer chocolate flavour from the raw cacao powder. Have you made this chocolate banana mousse? Gently melt the coconut oil by placing it in a bowl over a pan of steaming water with the heat turned off (this should keep it below 42ºC and in its raw form). Place the banana and chocolate flavoured coconut milk into a high speed blender and blend until smooth. Slowly pour the melted coconut oil in through the top while the blender is running. The mousse should whip up a little and turn a lighter chocolate colour. Pour the mousse into serving bowls and place in the fridge to set for 30 minutes. 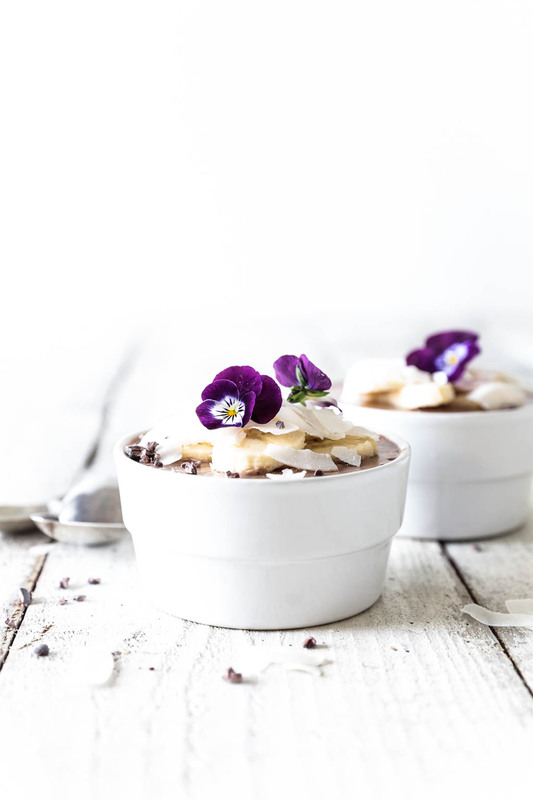 Serve the mousse chilled, topped with banana slices, coconut flakes and cacao nibs. The mousse will keep in the fridge for up to 5 days, but is best eaten fresh on the day it is made. Gently melt the coconut oil in a bowl over a pan of steaming water. Place the bananas, coconut milk, cacao, maple syrup and salt into a high speed blender and blend until smooth. mousse. It should whip up a bit and turn a slightly lighter chocolate shade. Pour the mousse into serving bowls and place in the fridge to set for 30 minutes. Serve the mousse chilled, topped with banana slices, coconut flakes and cacao nibs. The mousse will keep in the fridge for up to 5 days. Get free my top ten tips for cutting sugar guide! I tried this mousse and found it amazingly good. Light, tasty and with a nice flavour of both banana and coconut. I prepared it twice already. In my case the melted coconut oil does not combine well into the mousse, and the more I mix it, the more spread apart it seems to get, making my mousse full of plenty of white little dots. Any advice on what I should do different would be welcomed. Thanks!